Of all the things that have been helpful to me in personal growth and goal achievement, using my journal daily is at the foundation. Writing in my journal every single day is the glue that holds everything else together. My journal is the context for my dreams. It’s my favorite place to be. It’s where the mental creation happens. And because my mental creation recurs on a daily basis within my journal, the physical creation is organic. It’s simple. Achieving highly specific goals becomes very, very predictable. Confidence becomes a continually growing loop where ideas quickly become realities. 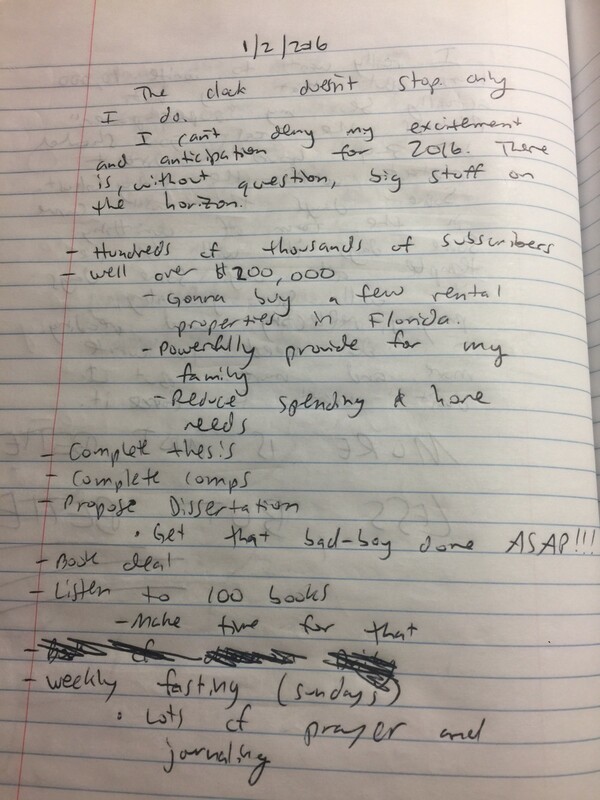 In this particular article, I’m going to detail the nuts and bolts of specifically how I use my journal, on a daily basis, to achieve any goal I set. To be clear: although journaling is something I believe should be done on a daily basis, there are particular times and places in which it is most effective. Your journal is not only where you record your insights and inspiration, but it’s where those insights become solidified and real. 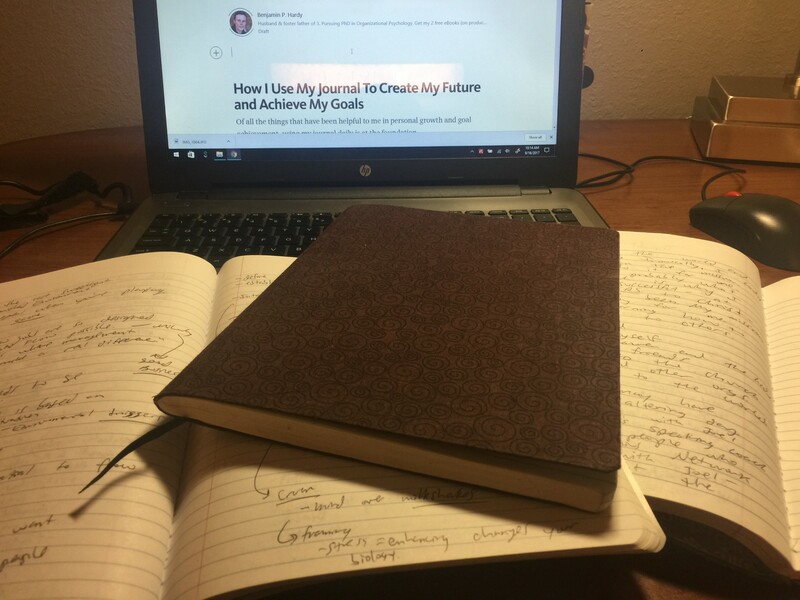 Your journal is where you begin thinking deeply about your insights and ideas, and where you strategize and plan the execution of those insights and ideas. In fitness, you push yourself to your limits during a workout and then allow adequate time for rest and recovery. It is during the rest and recovery that you actually experience the benefits of your exercise. If you don’t allow for adequate rest and recovery, then your workout efforts are wasted. Not only are they wasted, but your future workouts won’t be as good, because you won’t be rested or getting stronger. You’ll plateau. Herein lies the difference between calculated and systematic productivity and being busy. Most people are always plugged-in, always going, and thus are busy. Hilariously, they think being busy is being productive. It’s not. Similarly, your body needs rest and reset cycles from digesting food. This occurs in the form of fasting. When you fast for 18+ hours from digesting food, your body is given the space for recovery. If you never give your body space to recover and reset, then you miss out on countless benefits. The same is true of your mind. The best ideas and insights occur away from your work. They happen while you’re relaxing, or often while you’re thinking about something completely unrelated. When it comes to having clarity about your life and goals, you need to give yourself a reset, regularly. The most successful people in the world purposefully carve out time in their regular schedules for unplugging, recharging, and resetting. Take the famous example of Bill Gates, who took “Think Weeks” where he would completely remove himself from work and all forms of communication. All he would do is think, learn, and rest. And he admits that his best ideas for Microsoft came during those rest and recovery weeks. You may not have a full week to rest and recover. Instead, you could begin to schedule in “disconnected days,” where you take a day off work and give yourself the full day to simply rest and recover. During that time, it would be helpful to leave your regular environment, and perhaps drive 30+ minutes away to get adequate space. During these disconnected days, you could spend a good amount of time thinking, relaxing, learning, and then writing in your journal. The reason you want to get out of your day-to-day routine and environment is so you can step out of the trees and see the forest. You need some fresh air. You need to breath and reset — just like fasting for your body — from the constant stress of going. During these disconnected moments, it’s best to remain fully present and unplugged from your work and life. This is very hard for most people, as most people are addicted to their technology and work. Hence, psychological research is finding the importance for psychologically detaching from work on a daily basis. Only those who truly detach — mentally, emotionally, and physically — can re-attach when they start working again. In order to get absorbed and engaged in what you’re doing, you need to rest. Rest is where you grow and recover, so that you’re empowered to get better and better at your work (or fitness) when you’re there. So you want to get away. Completely outside of your busy life and allow some time to reset. A crucial component of this resetting is pulling out your journal and writing a lot. But before even writing in your journal, you want to get your mind in the right place. That’s why taking 30+ minutes to get out of your regular environment and preparing yourself mentally is key. While preparing yourself, you may read or listen to some inspiring content. You may do a workout. Or talk to a close friend or family member who always seems to put you in an amazing mood. You want to put yourself into a peak-state before you start writing. Naturally, being out of your regular environment will trigger positive emotions, especially if you know you’re going to spend the next few hours diving deep into learning, recovery, planning, and visualization. Other specific strategies to enhance your journaling experience are meditation and prayer. There is a great deal of confusion regarding what meditation is and what it’s for. The mainstream belief, which stops so many people from developing meditative habits, is that meditation is about stopping your mind from thinking. This isn’t what meditation is for. Meditation is for getting clear on what you want, and ultimately, about living a better life. Meditation can take on many forms. As can prayer. To me, both go hand-in-hand. And giving yourself some time to pray and meditate just before you write in your journal puts you in an elevated mental state to write from. However, sometimes, that elevated state occurs after you start writing, especially while writing what you’re grateful for. This whole process, the pre-journaling routine and the journaling process itself, is intended to take you deeper and higher into yourself, your dreams, and your ambitions. Start with gratitude and appreciation for everything happening in your life. Take plenty of time to reflect on and write about all the details of your life and relationships. Write about all the people who matter to you. Write about how far you’ve come. Write specifics about what is happening, and what has happened, since the last time you had a recovery session. Recording your history is a crucial component of journal writing. It provides context to your ideas, goals, and plans. 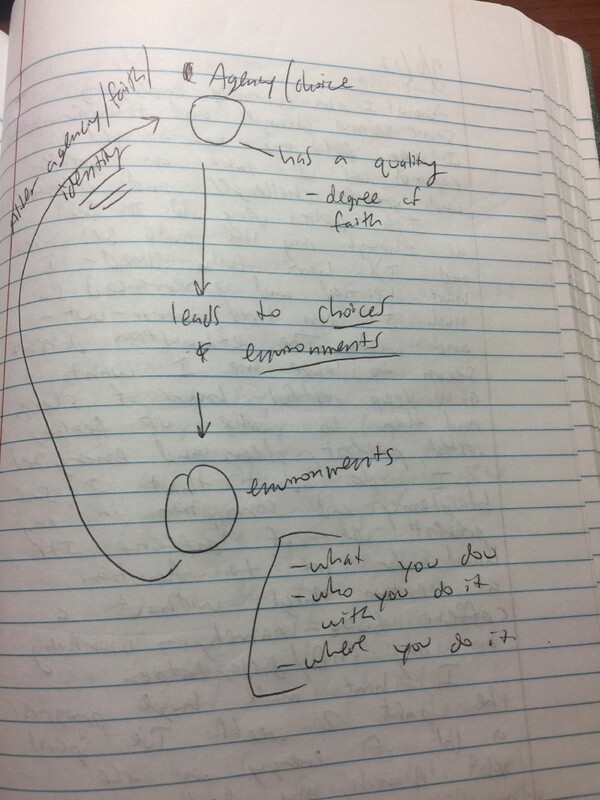 Be radically honest with yourself about what’s going on in your world in your journal. After you’ve just expressed gratitude and appreciation for the brilliance (and struggles) in your life, you need to be honest with yourself about where you’re not showing up. While in a peak state, you need to commit to making specific changes. 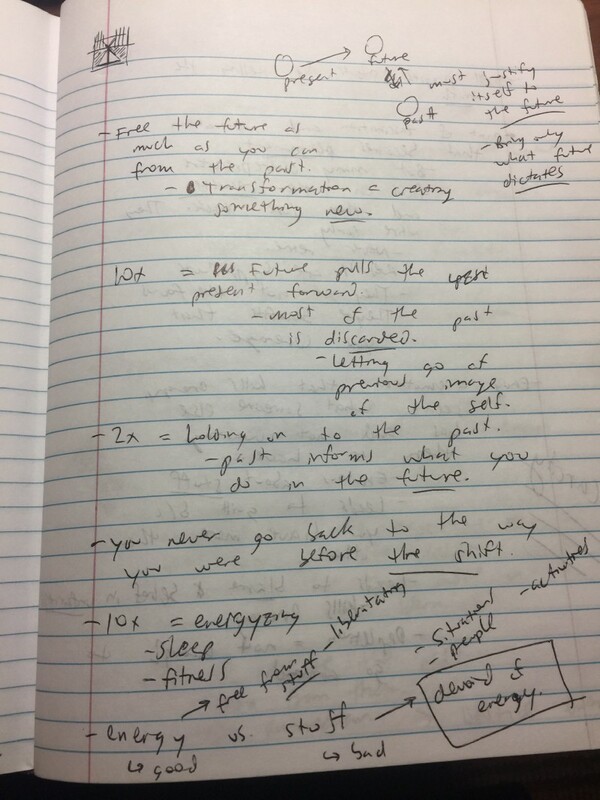 Write down the key changes you need to make to achieve your dreams and ideals. Write down everything that comes to mind. Journaling is a powerful therapeutic and healing tool. While writing about the things you need to change, openly write about the frustrations and difficulties that have led you to where you are. Write about why you’ve struggled to make these changes in the past. Be very honest and vulnerable with yourself. No one else is going to read what you’re writing. The purpose of this writing is for you to get clarity, and to re-establish your priorities and focus. If you can’t be honest in your own journal, how can you expect to be honest in the rest of your life? Write about your big picture dreams. These could be framed as your life vision, your 3–5 year goals, or your goals for the next 3–12 months. It’s good to take some time and think about what you’re trying to do from the big picture before you zero-in on the specifics right in front of you. A key component of writing big-picture is that it reconnects you with your “why.” It’s very easy to lose sight of your why during your daily routine and busyness. Additionally, there is a huge difference between “means” goals and “ends” goals. And your ends goals are the things that truly matter to you. They are the things you want in and of themselves, not because they will enable you to do what you really want. For example, getting a college degree so you can get a great job is a means goal. But what is the end? The end is what really matters, and you can save a lot of trouble by beginning and continuing with the end in mind. You can avoid pursuing goals that are societal expectations. 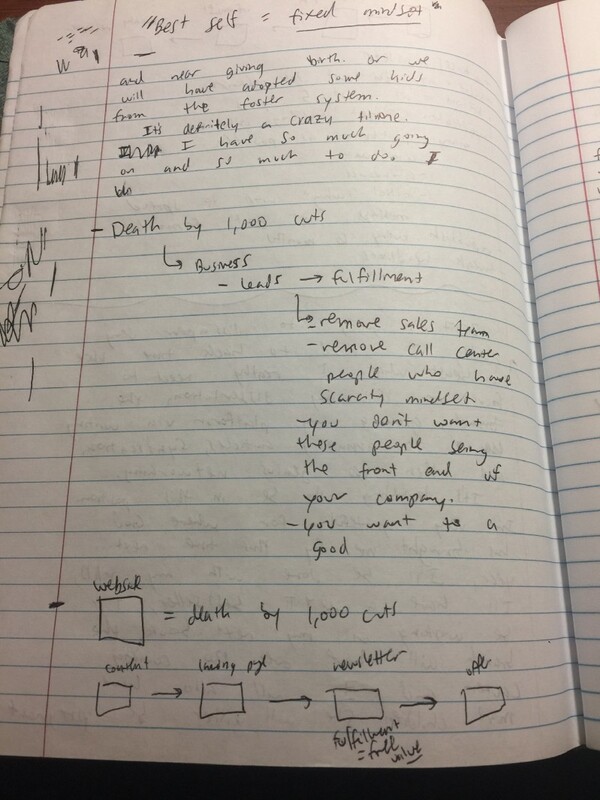 Below are images from my own journals related specifically to my goals. Some are from more recently, and I threw an oldie in from early 2016. The purpose of showing you these images is not to focus on the content of my journaling or goals, but to focus on the continual process of using your journal to frame and achieve your goals. 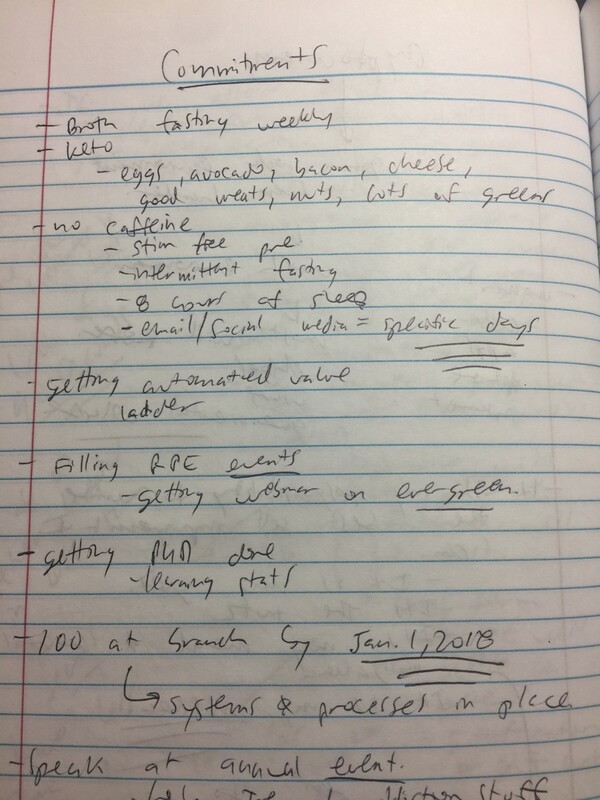 It’s effective to have a condensed or similar version of this recovery journaling session during a weekly planning session. Every week, it’s important to reflect on your previous week, and to make better plans for the following week. Weekly planning sessions are essentially an expanded version of your morning journaling ritual, which will be detailed below. Every big decision you make should be done while in a peak state. Decisions are things you’re truly committed to. One of the most effective ways to get into a peak state is by leaving your routine and environment. You need some time to disconnect and reset. During this recovery session, it’s key to not browse the internet, social media or email. It’s good to have your phone with you, but only to act upon insights you get while writing in your journal, while listening/reading a book, or while pondering/reflecting. Often, you’ll get insights about key people in your life. You should immediately make communication of some sort with the people who come to mind— whether that means sending them an email or text, or giving them a phone call. Recently while writing in my journal, I got the insight to send flowers to some people who have recently helped me. I immediately pulled out my phone and ordered flowers to their address. Then I continued my journaling. The remainder of this article focuses on your daily morning journal session. Most people start their day in a reactive way. The first thing they do is look at their smartphone and immediately get sucked into a digital world of other people’s information and agendas. They’ve set themselves up to live the remainder of their day in a distracted and reactive manner. A morning routine can entail many different things, such as fitness, meditation, prayer, working on a creative project, etc. All of those things are incredible. However, there is one thing I believe to be the most essential in the morning: writing in your journal. Writing in your journal is more powerful than simple meditation for the same reason that writing your goals down is more powerful than leaving them in your head. Meditation and prayer are powerful ways to make your journaling session more effective. However, meditation, prayer, and visualization in and of themselves are not enough. You need to write down the insights, plans, and goals you have. And you need to write them down daily. Meditation, visualization, prayer, and journaling are all powerful activities that go very well together. But the journaling portion is where you solidify, clarify, affirm, and strategize your insights, goals, and plans. 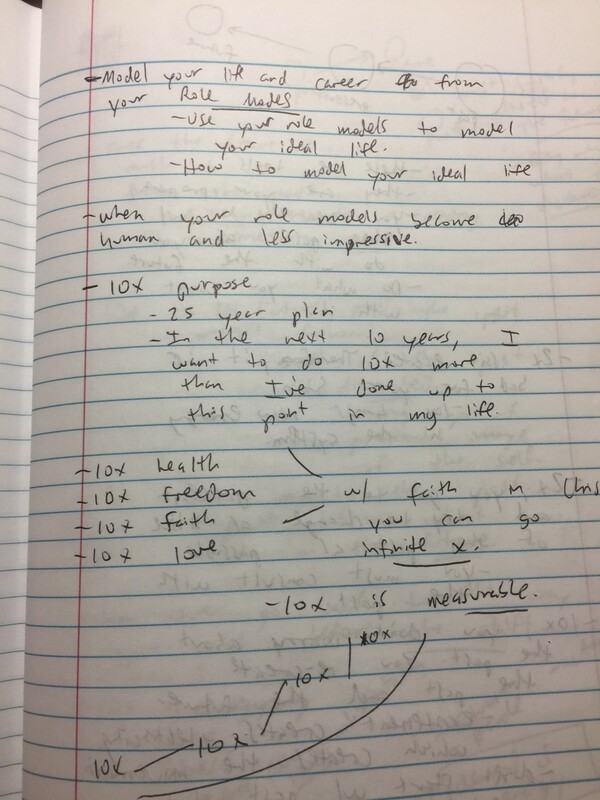 Journaling makes the other keystone activities 10X or 100X more powerful. If you’re not using your journal daily, then your meditation, visualization, and prayer will be far, far less effective. The key purpose of a morning routine is to put first things first. To focus on the important stuff in your life, rather than the urgent. The goal is to put yourself into a peak state so you can then operate from that state in all you do, every single day. This is how you get out of survival mode and get massive momentum in you life. Momentum leads to confidence, which then leads to bigger and bigger dreams, better service and value you can provide, and a more congruent life. Thus, fitness and creative projects are great morning activities. However, nothing should come before priming yourself into the state of being you plan to operate from for that day. Here’s where meditation and journaling come in. Your conscious and subconscious mind, as well as your creative brain and energy levels, are in the optimal condition immediately following sleep. This morning journaling session only needs to be 5–15 minutes. When you write your goals and dreams down first thing every morning, you deepen your own sense of belief and desire in your goals. If you don’t believe you can achieve your goals, you won’t. If you don’t really want to achieve a certain goal, it probably won’t happen. So, every morning, you need to put yourself into a place where you’re reminded of it, you believe it, and you want it badly. As a result, you’ll work hard that day, and every day, to not be distracted nor derailed from what really matters to you. The image above on the left actually shows the planning session I had the night prior. 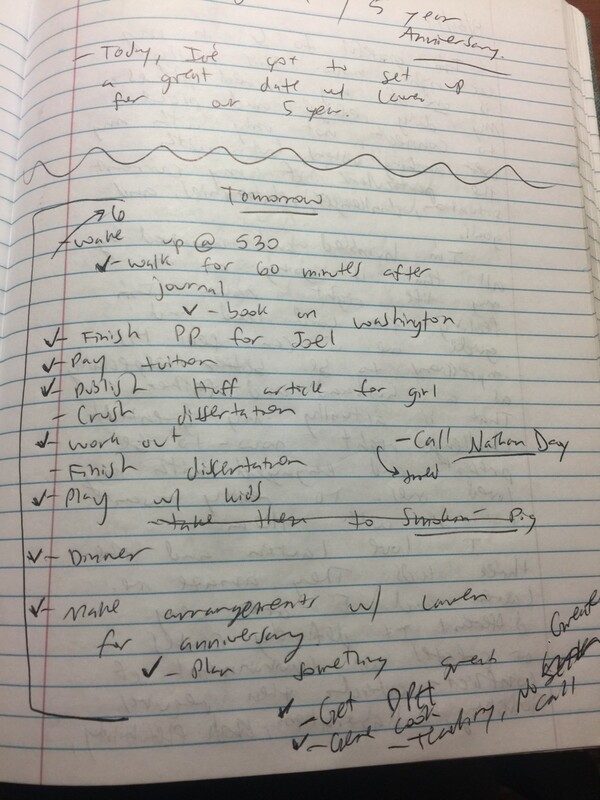 Consequently, during my morning routine, I usually briefly review and revise my plans made the evening before. 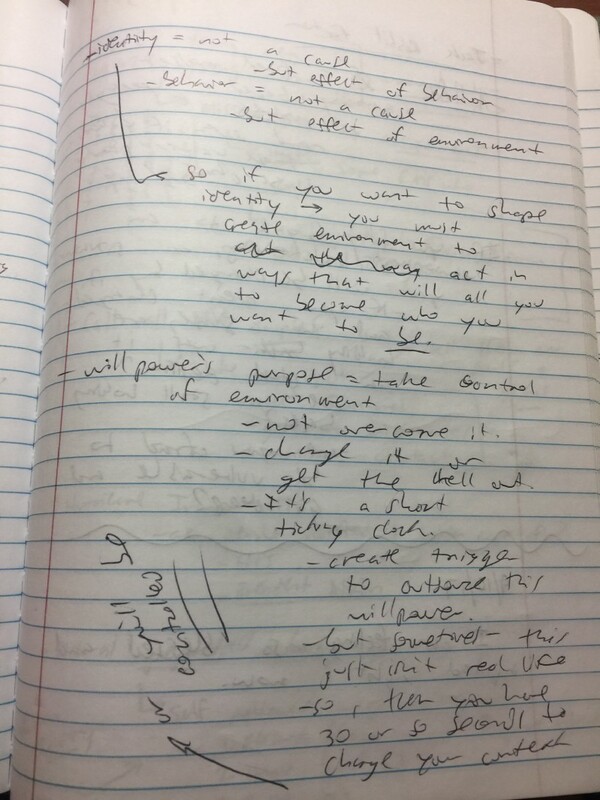 Another thing you can do in your morning journal session is write about the ideas you have. 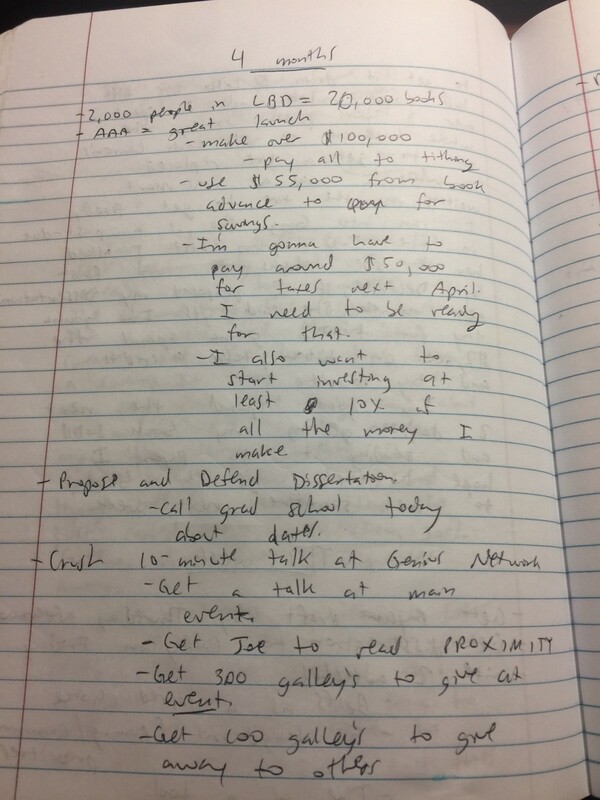 For example, it’s during this 15 minute journal session, usually right before I go into the gym, that I write down ideas for articles I want to write. Your brain is very creative first thing the morning. Your energy levels are also very high, especially if you don’t immediately plug into your email or social media. If you’re trying to do creative work, or really any work in general, it’s very effective to write ideas or plans down first thing in the morning. You’ll get amazing insights that will make the actual work you need to do so much easier. 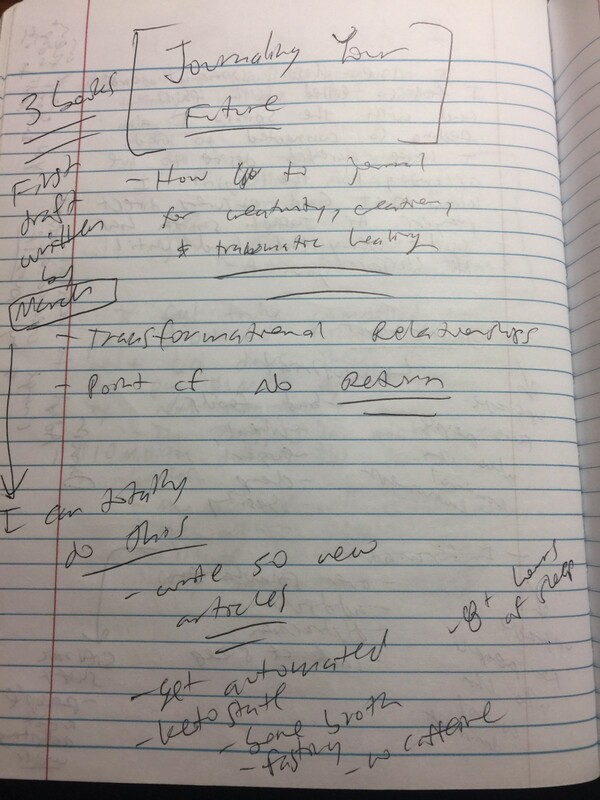 As it relates to my own writing, I can spend a few minutes sketching articles ideas in my journal, which then makes writing an actual article 100X faster and easier. 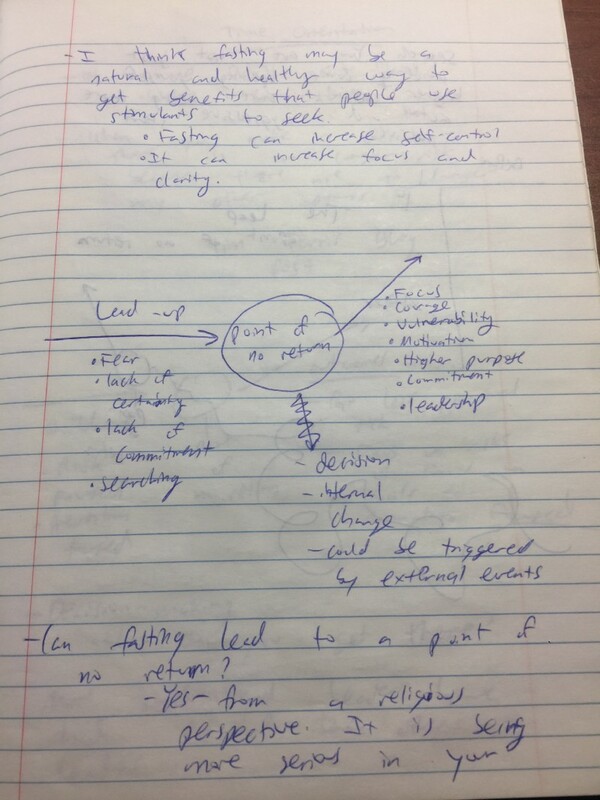 Once I sit down to write, the main thinking and framework are done. All I need to do is open my journal, remind myself, and then write. 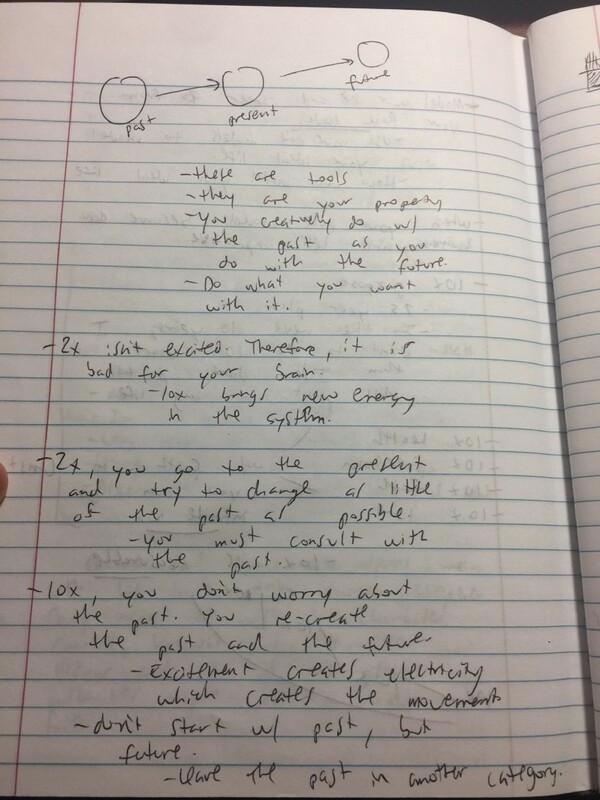 Here’s some examples of my journal ramblings as they relate to ideas and things I’m working on or thinking about. Your journal is your most powerful resource for manifesting your dreams. Writing in your journal compounds and deepens the essential activities of meditation, visualization, and prayer. If you’re serious about achieving specific and big things in your life, you need to put yourself into a peak state and make a firm decision from that state. Usually, that will require getting out of your normal, day-to-day routine, where you can get clarity. However, making that “decision” isn’t enough. You then need a routinized and daily way of triggering yourself back into a peak state. You need to daily operate at the level of your decision if your decision will become a reality. Every morning, you can use your journal to prime yourself into the person you need to be — that day, and every day — in order to make your dreams a reality. You do this by writing your goals and dreams down in the affirmative every single day. You then write down all the ideas, thoughts, plans, and strategies that come to your mind about what you need to do in order to achieve those goals. You write down the distractions you need to remove from your life that are stopping you from getting where you need to go. You also use your morning journal for ideation and creation. Your brain is very creative and your subconscious mind is very susceptible first thing in the morning. While writing about your ideas, you’ll get a ton of creative breakthroughs that will enable you to do amazing work.